Transportation Is Getting a New Look (交通战线换新貌) is a meditation on the manner in which history is written and who gets to write it. 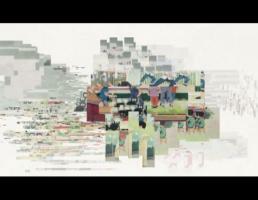 The video presents a continuous reconfiguration of an old Chinese propaganda poster, fragments of which are superimposed into unpredictable patterns, contrasting textual, representational, and analogical modes of indoctrination. The resulting images were inspired by the anonymous public collage of posters on a city wall; new messages cover up older messages, forever fading into the background. The video’s continuously evolving structure is well-suited to its subject matter, using a process to evoke a process.